Specialization may be the trend in business, science, and academia, but birds who wish to succeed in tomorrow’s demanding environment should not specialize, but generalize. In this era of increasing urban sprawl and habitat fragmentation, birds with fewer specific environmental requirements are far more successful than birds with many. That means the birds that we encounter most frequently in the field will be generalists. Generalist birds are easier to identify than specialist birds. The issue is one of adaptability. Ecosystems are being chopped up, parceled out, and paved over everywhere you look. Complexity gives way to simplicity and eventually monocultures. Even the climate is changing, by degrees that may be imperceptible to our species but life-changing for countless others. Birds that aren’t picky about what they eat or where they live, species that can tolerate a bit more pollution than the next, are the birds you will see most often. In uncertain times, those species that are flexible will flourish. The divergent destinies of two Strix species owls exemplify the advantage of adaptability. The Barred Owl gets by pretty well anywhere, whereas the Spotted Owl not only prefers, but actually needs multilayer old-growth forest, at least 100 years old but preferably more than 200 years old. One of these species is in the process of expanding its range. The other relies heavily on government protection and intervention to survive. Which one do you think is prospering? Which do you think you’re likely to see on a walk through the woods? The generalist vs. specialist axis has a lot of overlap with previous examples of contrast. In considering common birds vs. rare ones, for instance, generalists are usually common and specialists are usually rare. The difference here is one of degree. When we look at the success of particularly adaptable species, we’re not talking about the abundance of Common Yellowthroats relative to Cerulean Warblers. This is more like Red-tailed Hawks compared to every other species of hawk in North America. Red-tails seem to thrive everywhere, circling skies and monitoring highways from sea to shining sea. These generalists are so successful that they should almost always be the first name that comes to mind when a buteo comes into view. A list of generalists also looks a lot like the roster of species one might spot at a bird feeder. This is no accident as generalists will happily exploit any available food resource. But distinctions might be made between your average feeder species and intrepid adaptable species. The White-breasted Nuthatch, for example, is a feeder staple anywhere within its range. Nuthatches do very well for themselves, but are designed for a certain style of bark-gleaning and consequently cannot prosper in absolutely any ecosystem. Chickadees are another story. You’ll find Black-capped Chickadees right alongside nuthatches at feeders across the northern United States. They’ll also pop up in the same deciduous forests and wooded suburbs nuthatches frequent. But the amazingly adaptable chickadee willingly ventures where nuthatches and other less versatile birds fear to tread. I’ve spotted flocks in the middle of remote winder wildernesses as well as right outside my Bronx apartment window. They are just that adaptable. No list of generalists would be complete without a mention of invasive species.Â Some birds, when inserted into an unfamiliar environment thousands of miles from home, would quickly become food for the natives. The truly special ones take hold to not just survive, but thrive. 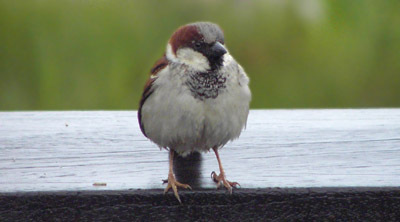 Supercompetitors like House Sparrows and European Starlings are so uniquely suited to the trappings of Western civilization that they increase in numbers and range with every passing year. These are usually the first birds on a new life list, the given birds on any trip list. Expect them and accept them; all the wishing in the world won’t turn a House Finch into a Purple Finch. Some birds are more robust than others. When you see ducks, expect Mallards. When you see flycatchers, expect phoebes. When you see doves…well, all doves are pretty adaptable.Â These birds are not necessarily distinctive because of any obvious physical traits. Rather, they are distinctive because they are always in sight. Beginning birders should get to know the generalists on their home turf well. Not only will these birds be popping up frequently during local excursions, but they’ll probably appear everywhere else you go! Hi i was just wondering if a hawk is a generalist or a specialist? Ashley, most hawks qualify as generalists. North America’s ubiquitous Red-tailed Hawk is certainly one. I was wondering about the whooping crane? Specialist or Generalist? T.J., Whooping Cranes should be considered specialists because of their extremely specific habitat needs: their genetic commitment to breeding on taiga muskeg has left their population in dire straits. Which of these four birds would be considered a generalist and which one or ones a specialist. Double Crested Cormorant, Great Blue Herron, Wood Stork, and American Robin. Definitely generalists, which explains their success in expanding with the pace of development.